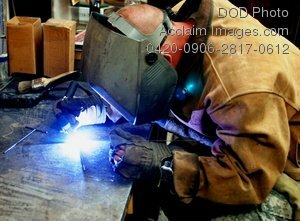 Description: Free, public domain image: Military Metal Worker Welding a Handle. Sgt. Stephen Hammontree, a metal worker with Company B, 603rd Aviation Support Battalion, welds a T-bar handle in his shop at the flight line near Camp Striker, Baghdad. (U.S. Army photo/Sgt. 1st Class Steve Opet.